Open to the public from the 12-18 February, the exhibition 'Sophia with Love' organized by the A. G. Leventis Gallery and the 'Sophia Foundation for Children', showcases 100 works of art by Cypriot artists. The theme is inspired by Valentine’s Day, whilst the exhibition’s main purpose is to raise money to support the work that the 'Sophia Foundation for Children' undertakes in Cyprus and in Kenya. One hundred stone hearts were made in Kenya and given to Cypriot artists to use their creativity to decorate them. These hearts will be on display at the A.G. Leventis Gallery and available for purchase. All the profits from the sales will be used, via the ‘Sophia Foundation for Children’ ,to aid in the improvement of the living circumstances and educational opportunities for children in Kenya and in Cyprus. The 'Sophia Foundation for Children', is an NGO founded to help fight poverty and its consequences, particularly in relation to children. In Kenya, it focuses on offering educational and medical services whilst in Cyprus it runs the programme ‘I cook and offer’ for 16 all day primary schools and kindergartens. 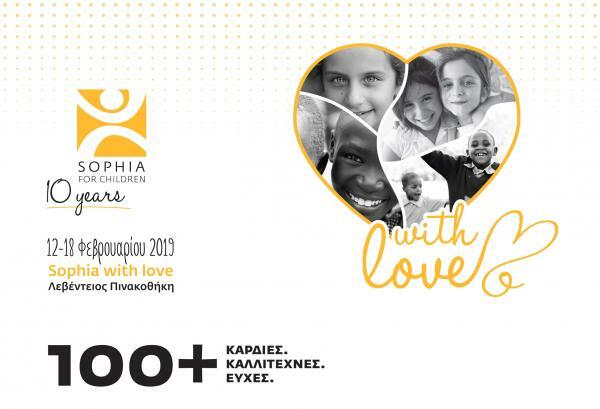 The exhibition 'Sophia with Love' has a media sponsor the publishing house Phileleftheros, who is also a permanent sponsor of the 'Sophia Foundation for Children'. The exhibition is co-organized by Partners Y&R and hosted by the A.G. Leventis Gallery. Travel Express has offered free transport of the hearts around the island, and all printed materials in relation to the exhibition have been generously provided by Kailas printing house, free of charge.